Moscow lies about MH17 route | What happened to flight MH17? MH17 was instructed by Ukraine Air Traffic Control to descend. MH17 flew a much more northerly route than it normally does. The deviation was instructed by Ukraine ATC. 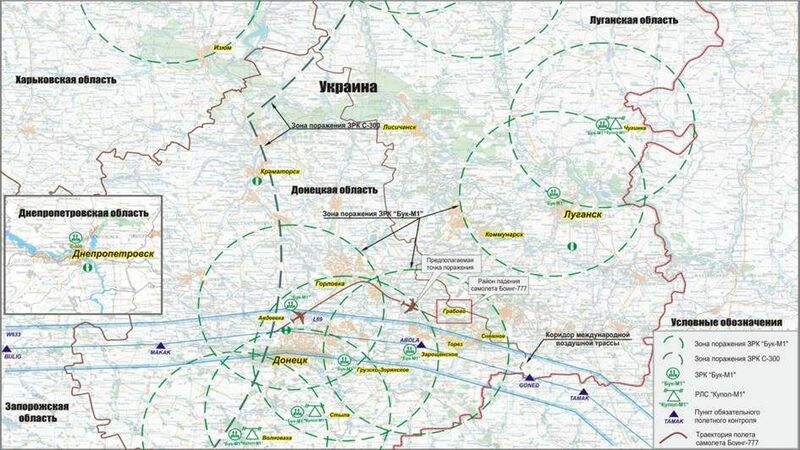 6.Why did Ukrainian air traffic control officers allow a deviation of the plane’s route to the north in the direction of the “area of the counter-terrorism operation”?. Both statements are clear lies. From a state like Russia with all their intelligence you may expect they know exactly what happened. So these false statements are not caused by mistakes or ignorance. These statements are done to blaim Ukraine. Actually Rostov ATC requested MH17 to deviate from its flightplan route to due crossing traffic in the Rostov controlled airspace. Later on Russia stopped with asking about route deviation. It was clearly debunked by the DSB report. For example Russia asked 25 questions to the UN Security Council. No questions on routes. Just the obvious questions valid for any aviation related crash. 1. MH17 was instructed by Ukraine Air Traffic Control to descend. Independant source Flightradar 24 shows MH17 flew on 33.000 feet (FL330) and never descended. Actually Kiev asked MH17 to climb to FL350 (35.000) but MH17 declined possibly due to the weighth of the aircraft. The Dutch Safety Board confirms this in the transcript between ATC and MH17. Not true. See my detailled blogpost about the routes taken by MH17 the previous days in July. MH17 always flew the same route. ARNEM, SUVOX, MOBSA, BEMBI, PEKIT, TAMAK etc are waypoints. These are point on a route flown by aircraft. Below the route as pubished in the DSB report. You see the red line pass north of the point marked in blue as DON. This is Donetsk. Now lets compare the actual flown route to the presented route of the Russian MoD. The Russian Mod suggest a route flying over waypoints Bulig, Makak, Donetsk, Abola, Goned and Tamak. This is completely different than the actual flown route. Below a slide presented by the Russian Mod. Not only the route is not correct, the deviation to the north also never happened. The deviation is suggested by Russia as being an instruction of Ukraine ATC to lead the aircraft over the warzone. Actually the filled flightplan went directly over the warzone. A bigger picture here. So lets have a look at both routes in a single picture. The green line in the image below shows the actual flown route. The yellow lines shows the suggested route by Russia. The red pin is the last position recorded by the Flight Data Recorder. On the image above you also see a black line. The line is heading southeast from the red pin towards Rostov. This is the route which was ordered by Rostov Air Traffic Control. In the image of the route presented in the DSB report you see this route as dotted lines. Rostov ATC requested Ukraine ATC to have MH17 divert from its flightplan route. It was supposed to cross the Ukraine/Russia border at waypoint TAMAK. However, there was an Aeroflot aircraft flying from Moscow to Sochi (SU1124) at the same altitude as MH17 (FL330). So MH17 did not get a shortcut but actually got a detour probably to avoid SU1124. 14 seconds after the instruction to divert to waypoint RND (Rostov on Don ) the FDR and CVR of MH17 abruptly stopped. I was wondering if Russia themselve could proof they were lying. Russia MoD presented a video showing a recording of the radar screen. I made a screenshot of the video and removed the black background. Then I made a screenshot of Google maps showing the area around Donetsk. I put the screenshot of the radar image over the Google maps screenshot. Then I adjusted the scale of the radar image to match the scale of Google maps. I also had to rotate the radarscreen 3 degrees. The image below is the result. The radarscreen does not show the previous minutes of flighttrack of MH17. You can guess why.